If you are in search of a record book moose because he has survived many previous hunts, and you as a hunter respect the survivability of the animal, then you have set a high standard for yourself. Pursuing any type of world record is not something that many aspire to do. for the trophy hunter, shooting a world record moose is the ultimate goal. Are you a trophy hunter? Or a meat hunter? Do we need to continue to search for the ever bigger? Then when we find it, is it right to destroy it? Should we limit the very essence of the mighty beast; snuff out the possibility of procreation? These are tough questions? Hunter Heinz Naef shot what he believes could be the largest moose ever harvested in the Yukon(Sept. 2013). 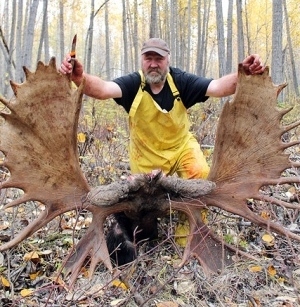 His moose, scored 263 1/8 inches after the required drying time of 60 days. The official scoring will be made in Nevada in early 2014. Heinz is not a trophy hunter, he wasn’t looking to harvest a world record moose. No, he is a meat hunter… by his own admission. He was just out looking for any legal moose to fill his freezer. It just so happened to be this one. Human beings have pushed everything to its limits. The Guinness Book of World Records is a testament to this. We strive to better ourselves, to beat our predecessors, going beyond what anyone has done in the past. Is it wrong to have the desire to be better, to do it bigger? Is our only purpose to get our names in a book? When entering animals into record books, who deserves the respect? You or the animal? It is vitally important to include all relevant information about said trophy… the hunters name however may not be so important. Many hunters have a few trophies on the wall, but most are not world record moose, but all of them are trophies to the hunter. Many hunters do not go hunt with the sole purpose to acquire a trophy, and likely many of you, may scoff at some of the animals that have been shot. They are not in any record book, nor are they of that class, but to the hunter, they are a reminder of the hunt and a way for to show appreciation for the animal. No animal should be killed for the sole purpose to raise a hunters social status, to do so is crossing the ethical line for hunters. 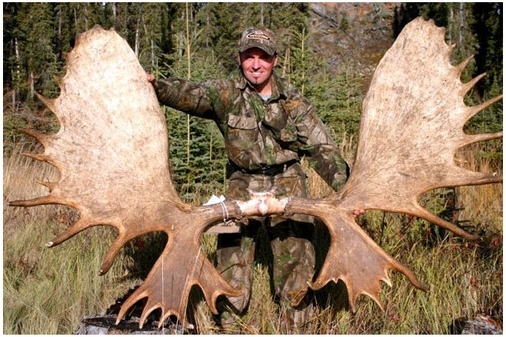 Where does one find a world record moose? This question is one that no one person can answer for sure. Through research and dialogue you may be able to locate moose habitat that will contribute to the growth of these monsters. A hunter in search of a world class moose will spend a lot of money and time to achieve his goal. These big animals are not going to be easily accessible. Days, weeks even years of pursuit to harvest a moose that can make the record books will be the required dedication. Hunting the most remote areas of the planet is what it will most likely take and never discount luck. Luck is a huge part of hunting. 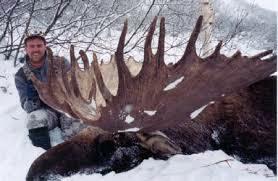 As an example the latest world record moose taken with a rifle, shot by Jay Link in 2001. Jay travelled to Russia, to the very remote regions to get this moose. He has stated it cost him $20,000.00 to do this hunt (before shipping and taxidermy). Jay may not have been looking for a world record when he shot this one, but he was certainly looking for a world class moose. Unfortunately for Jay, because the moose was taken in Russia, it is not eligible for Boone and Crockett. 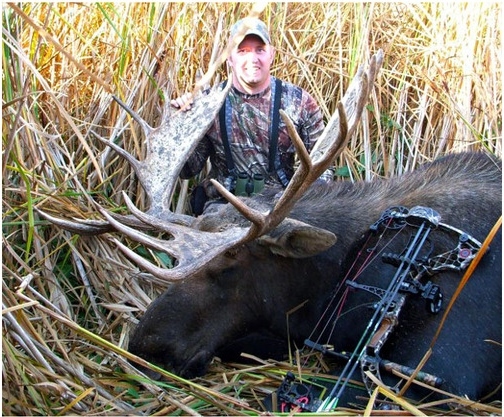 Aaron Folk killed this state record North Dakota moose in October 2012, with a green score of 166 and a 53-inch spread. 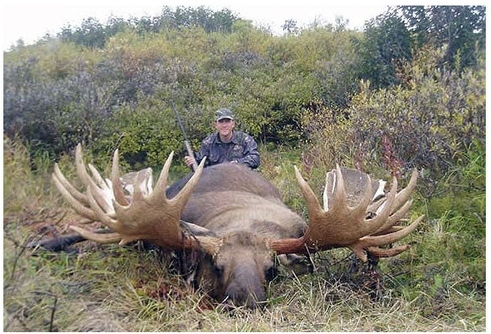 Real Langlois, who’s been dubbed “The Rackman” for all his moose hunting exploits, bagged this world record bull in the Yukon with his bow in 2008. With a score of 249 1/8, The Rackman beat out Michael Cusack, whose 1973 bull moose scored 248. Eric Arnette killed this Yukon monster in 2004, with a Boone & Crockett score of 236 and a span of 75 inches. The world record moose, Boone and Crockett scored 261 5/8 and was taken by John A. Crouse in 1994 near Forty-mile River Alaska. Hunters value the opportunities to venture out into the outdoors and hunt. The chase is wonderful and exhilarating. To some degree the kill is saddening as a wild animal has paid the ultimate sacrifice and many hunters pause to give thanks for any animal that they just harvested. They truly appreciate it! Many hunters don’t hunt for a trophy – after all the antlers will make poor soup. Given the opportunity though, if a world record moose were to walk out in front of you, and assuming you recognize it as a trophy. Would you shoot…? Would You?